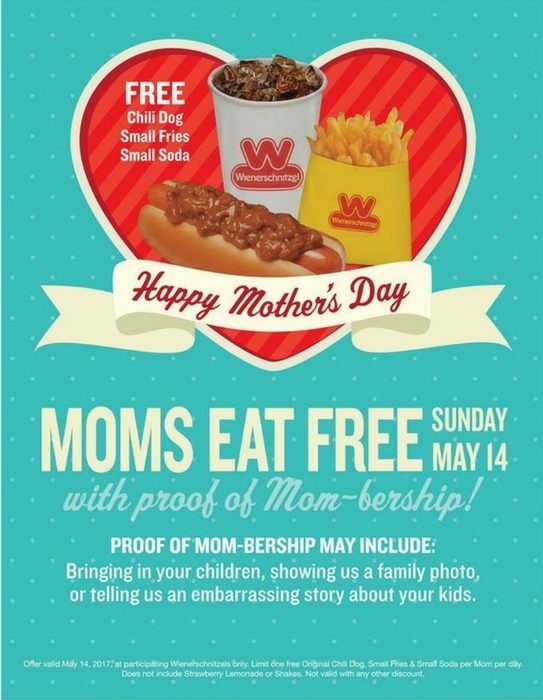 FREE Chili Dog, Fries & Soda For Moms! May 14 Only! You are here: Home / FREEbies / FREE Chili Dog, Fries & Soda For Moms! May 14 Only! May 14 Only! For all moms out there! Head over to your local Wienerschnitzel store to score a FREE Chili Dog, Fries & Soda! Just simply show a proof of you being a mom by bringing your kids, showing your family photo or telling them an embarrassing story about your kids! What a wonderful treat for Mother’s Day! Find your local store here and get your FREEbie!